Huawei’s latest flagships have arrived and if you’ve managed to resist the Samsung Galaxy S9 then these could be worth considering, but which one is right for you? To help answer that question we’ve put the Huawei P20 and Huawei P20 Pro head to head, comparing all their key features, including their screens, design, power, camera and battery. You’ll find all that below, so settle in and read on for a rundown of two of 2018’s latest and potentially greatest flagships. There’s not too much difference between the design of the Huawei P20 and the Huawei P20 Pro. Both have a glass back and a metal frame and both come in a variety of colors, including black, midnight blue, pink gold and twilight, though the standard P20 additionally comes in a champagne gold shade. The main visible difference between them is the camera, which is a triple-lens one on the Huawei P20 Pro and just a dual-lens one on the standard P20. But arguably a bigger design difference is one that you can’t see, as the Huawei P20 Pro is IP67 certified, meaning it’s dust proof and water resistant to 1 meter for up to 30 minutes, while the standard Huawei P20 has no such certification. However, the standard P20 is ever so slightly slimmer at 7.65mm thick, while the Huawei P20 Pro is 7.8mm. You also get a headphone port with the P20, which you don’t with the P20 Pro. It’s also worth noting that both models come with a rainbow-like ‘Gradient Finish’ if you opt for the pink gold or twilight color schemes. While both the Huawei P20 and the Huawei P20 Pro have a 2240 x 1080 Full HD+ display with a super widescreen 18.7:9 aspect ratio, minimal bezel and a notch at the top, there are some significant differences between them. For example, while the Huawei P20 is 5.8 inches the Huawei P20 Pro has a 6.1-inch screen, and while the P20 uses LCD, the P20 Pro has an OLED screen, which tends to offer better contrast. The P20 Pro’s screen is likely to be better then – though we’ll let you know for sure once we’ve put the phones through a full review, and the extra size on the Pro model does mean it has a lower pixel density than the standard Huawei P20. Both the Huawei P20 and Huawei P20 Pro have a Kirin 970 chipset. That’s the same octa-core chipset as we saw in 2017’s Huawei Mate 10 Pro, so it’s high-end, but not quite as brand new as the Snapdragon 845 doing the rounds in a lot of 2018’s Android flagships. It’s paired with 4GB of RAM in the case of the Huawei P20 and 6GB with the Huawei P20 Pro, making for high and – arguably – top-end specs respectively. Both phones also come with 128GB of storage and a microSD card slot. The operating system is unsurprisingly the same on both, namely Android Oreo overlaid with Huawei’s EMUI 8.1 interface. The two phones also come with an NPU (neural processing unit) which powers all sorts of AI skills, such as photo organization and tagging. Like many recent phones, the camera seems to be a big area of focus for Huawei on its new flagships, and the two handsets don’t have identical cameras. With the Huawei P20 you get a dual-lens Leica camera on the back, made up of a 12MP f/1.8 RGB sensor and a 20MP f/1.6 monochrome sensor, and the 12MP camera has 61% larger pixels than Huawei’s previous 12MP snapper. The Huawei P20 Pro meanwhile has a trio of sensors on the back. It’s the world’s first Leica triple-lens camera, and it’s made up of a 12MP f/1.8 RGB sensor, a 40MP f/1.6 monochrome sensor and an 8MP telephoto sensor. Huawei claims it’s also the world’s first Leica zoom lens system, offering 5x hybrid zoom. The camera also sports large pixels and the highest ISO on a phone at 51200. Round the front both phones have a 24MP camera, and both support 960fps slow motion video at 720p resolution. Both phones also have AI camera skills, with the AI automatically changing modes according to what you’re shooting, and even assisting with the composition of shots. There’s also AI image stabilization to compensate for camera shake. So there’s a lot that’s the same with these two phone’s cameras, but with the P20 Pro you get more, headlined by that extra lens. As for the battery, there’s a 3,400mAh one in the Huawei P20 and a 4,000mAh one in the Huawei P20 Pro. 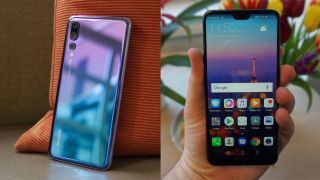 Both of those are fairly large sizes, with the Pro in particular coming in larger than most rivals – though there’s also a larger screen to keep powered than there is on the standard P20. Both phones also support Huawei’s Super Charge technology (seen previously on the Mate 10 series), so you should be able to juice them up quickly. There are a lot of differences between the Huawei P20 and the Huawei P20 Pro, and most seem to work in the P20 Pro’s favor, as you might expect, but not all of them, and the standard model still has a strong assortment of specs and features. Key differences include the screen, which is bigger on the Pro and uses OLED rather than LCD, the RAM, which you get 50% more of with the P20 Pro, the camera, which has an extra lens and additional features on the Pro, and the battery, which is bigger in the Pro. The P20 Pro also benefits from water resistance, which the standard Huawei P20 doesn’t, but the Pro’s screen has a lower pixel density and the phone has no headphone port – which might be enough to push some buyers towards the standard model, especially as the Huawei P20 will be cheaper.